This page will not be a complete how-to book, but a continuing discussion or forum on different strategies and techniques to help all anglers. HEY, DON' FORGET TO GO TO THE PAGES LISTED ON THE BOTTOM OF THE PAGE. DO IT!!! New this year, Rios hover line fills a void for stillwate fishermen. That is, we now have a line that takes away the effect of the wind on our near the surface. These lines sink slow enought to fish midges and damsels near the surface and they are not pushed around like floating lines. I think this will become a go to line for for still water anglers in most cases. They cast great and don't seem to have any coiling memory like other intermediate lines. I am really looking forward to fishing damsel nymphs on one of these. We have come a long way from when we used to cut up old SA ice blue intermediate double taper lines and make small heads. The Damsel Hanger System (Yes it still works)No I don't use this as an indicator, first it is dark and second, I can't see that well. It is just to keep the damsel pattern in the "look up zone" when trout are cruising looking for nymphs migrating to some place to hatch. I personally don't use indicators and won't start. Do they work, yes but I kink of think it is line kindergarten where you learn just enough to get you to first grade and take lots of naps. Learn to use the proper lines and retrieves for the bugs you are using and the water you are fishing and you will become a more accomplished angler. Maybe its just tradition or stuborness, I would rather catch less fish and know i did it by understanding the proper strategy and technique than just chuck it and wait. I have the same feelings about steelhead fishing and small balloons to support egg paterns. 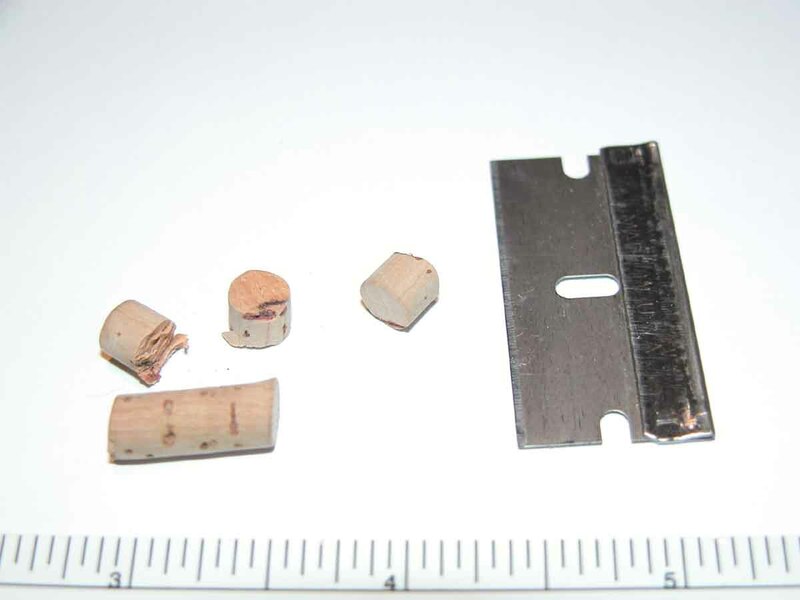 Step Two - Insert sewing needle into cork capable of holding 3x or smaller leader end. Step Three - Cut back your leader to a point just below where tippet section starts (for most tapered leaders that varies from about 12 inches to 18 inches). 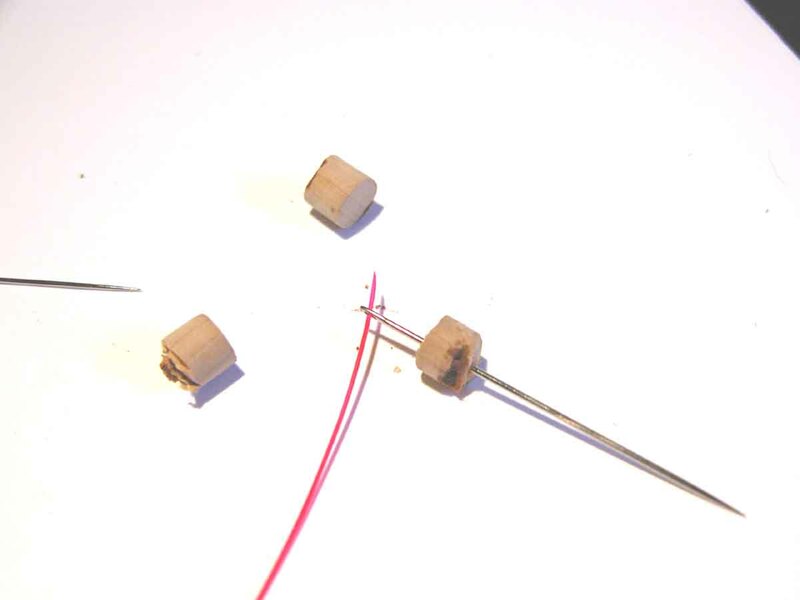 Insert the end of the lead into the eye of the needle and leave about a 1/2 inch or more going through. Pull the need through the cork so the leader end comes through. Note: I used 20lb amnesia just so you could see it better, it is obviously to large compared to a normal leader end. 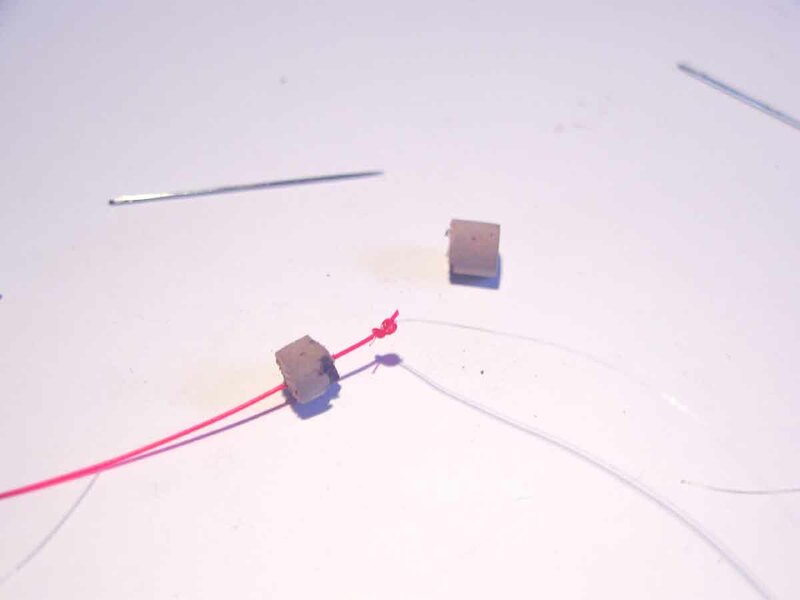 Step Four - Pull enough leader through the cork to tie a double surgeons knot between the leader and your tippet. Start with about 18 to 24 inches of tippet. Trim off the knot and slid the cork down to the knot so that it stays there. You can now trim the tippet section to a length that alows you to "hang" the nymph between a foot and 2 feet deep. I like to have about 8 to 10 inches of tippet when the fish are really boiling. Last Word - Yes this is just an indicator, but much smaller and easier to cast. If you want to change tippets or fish a dry or something deeper, just slide the cork up the leader and do your thing. I find by using the cork which is hard to see, I concentrate more on my line and keeping in contact instead of watching a bright indicator. Besides, where elese could I use up all those old cork tubes I have. Ps. I usually always use 2 flies when lake fishing except, when using this method.